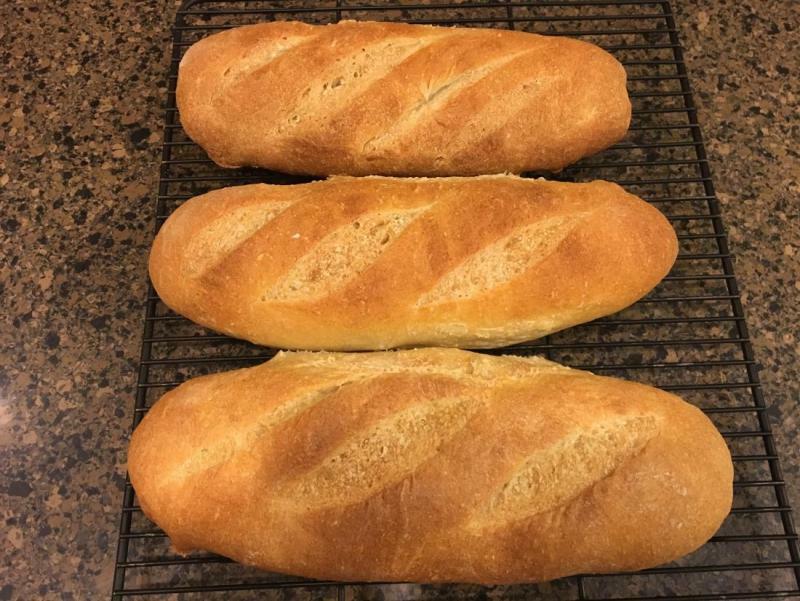 Started baking some bread for both Christmas Eve and Christmas Day dinner. Here are the first couple out of the oven. Edited by tctenten, 05 April 2016 - 09:13 PM. 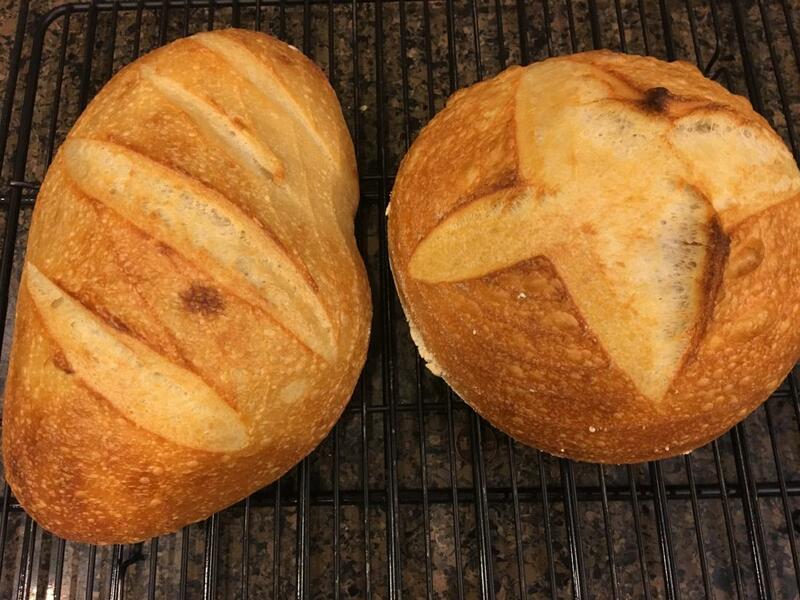 very nice looking loaves !!! THANK YOU JESUS. PEPPER PEOPLE ROCK!!!! I will be glad to share recipe if you like. The Bum is sending me some Herm version 2. I want to see how he sends it. Dry or wet. I will then send some of my starter out to you. Beautiful loaves T. Merry Christmas! Thank you. Merry Christmas Dru. No, no, no. Post it here. DON'T TOUCH ME UNLESS YOU'VE BEEN WEARING GLOVES! I use a kitchenaid mixer, so the instuctions will be for that. In one Kitchenaid bowl mix the water(lukewarm) and the starter with a fork until the there are no more lumps in the starter, then add oil. In another bowl, measure out the flour, salt. Dump the flour into the wet mixture and combine with the dough hook on speed 1. Probably takes a minute or two...just until all the flour is incorporated. Then let it rest right there with the dough hook down in the mixture. Use a paper towel or two to lightly cover the bowl. After the 30 minutes I mix on speed 4 for 6 minutes. After that put into an oiled bowl or plastic container and cover. Let this double, should take approx. 2 hours. After the first proof you have 2 options. Preheat oven to 500f. After oven is preheated turn dough onto a piece of parchment paper that is on a pizza peel or other flat surface. Score the top and stick in oven. Cover the dough with a large stainless steel bowl that was rinsed under hot water. Make sure it is large enough to not touch the dough. Then immediately lower oven temp to 450f and bake for 20 minutes...no peeking. Then take bowl off...use oven mitts and cook till the outside browns and the interior is 205F. Most importantly...let it cool. That is just as important as everything else. I am making more tonight. I will try to take some pictures. Please feel free to ask about anything that doesn't make sense to you or are unsure of. I am still new to this, but I have been having some pretty good results. Thankfully I was able to copy and paste the PM to Ryme. How do you make a "starter?" You can buy one. This is the easiest. I bought mine here. You can make one from scratch. I have done this as well. I maintain 2 starters. I am very happy with the one I bought, and wanted to try to make my own. Once they are "alive" it is very easy to maintain them. Edited by JoynersHotPeppers, 23 December 2015 - 11:40 AM. I'm going to have to make some after vacation so I can make some sourdough pretzels. One more batch to go. I always do it by hand but next time I'm trying it your way with my wife's kitchen aid or her ninja mixer with the dough mode. Thanks for the instructions. I want to start hand kneading, but I need practice. I will be curious if you see different results between the two. What is everyone making for Easter?